Ok so we have #GS12 and #dse2012 up first (and it feels like we only just got away from #ISE2012) but that doesn’t mean that we can stop planning or reporting on events further ahead and so it is that we bring you news of the first round of confirmed speakers for #Screenmediaexpo which of course takes place 16-17 May at Earls Court 2, London. 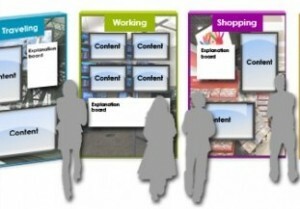 Speakers fit into four key education programme channels – Connected Screenmedia, Connected Content, Interactive Connection and Smart Connections. As in past years, the free to attend education programme will feature an assortment of high calibre individuals (just what insight John Ryan’s Nancy Radermecher will be able to impart to the audience apart from how to take a 80 Million dollar company and make it an industry laughing stock is a bit beyond us) from the screenmedia sector. Each has been carefully selected (obviously except for Nancy) for their expert insight, specialist fields and well-conceived, bespoke presentation submissions, which demonstrate academic intelligence balanced with practical knowledge, guidance and real-life examples. Speakers will include Chris Gorell Barnes, CEO of Adjust Your TV, Tim Huckaby, Chairman and Founder of InterKnowlogy and Actus Interactive Software, Nancy Radermecher, President of John Ryan, Carolyn Nugent, Head of UK Digital at Kinetic Worldwide, Paul Skeldon, Editor of M-Retailing, Jeremy Gavin, CEO/Head Content Chef at Screenfeed, Danielle Pinnington, Managing Director of Shoppercentric, Steve Cox, Marketing Director at JC Decaux Airport, Rob Thurner, Mobile marketing consultant, trainer and speaker, Alfio Pozzoni, Director of Research and Innovation at Fabrica, Giovanni Flore, Benetton Live Windows Project Manager at Fabrica, Nikki Baird, Managing Partner, RSR Research, and Bruno Zamborlin, Goldsmiths College, University of London/IRCAM – Centre Pompidou. Speaker biographies, photos, presentation titles and summaries will be available on the Screenmedia expo 2012 website. Ogilvy Digital Labs, Clear Channel, Smartbomb, Total Immersion, Grand Visual, iTaxiTop and Intel will also be participating, with speaker names yet to be confirmed. The four programme tracks of the education programme are designed to provide visitors with high-quality thought leadership that can be used to move their respective businesses or projects forwards. To submit a speaker proposal or to ask any questions relating to the education programme channels, contact chris.heap@imperativegroup.com. This entry was posted on Wednesday, February 15th, 2012 at 09:01 @417 and is filed under DailyDOOH Update. You can follow any responses to this entry through the RSS 2.0 feed. You can leave a response, or trackback from your own site.